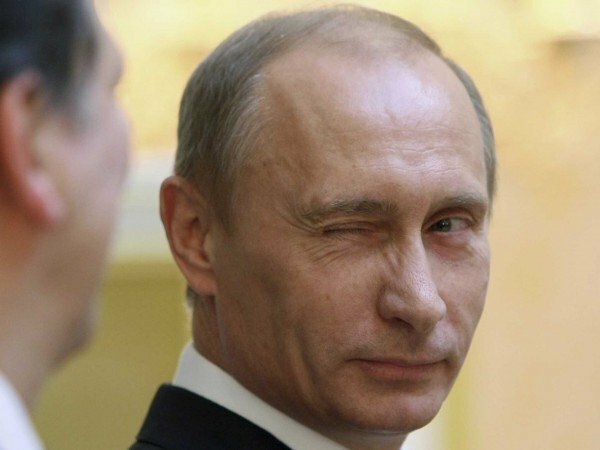 The left has lost their ever-freaking-loving minds over this Russia thing. They know what they are accusing Jeff Sessions of is untrue. They are trying to bully and bludgeon him into resigning. It’s not going to happen. He’s done nothing wrong… nothing that 30 other Senators haven’t done in the course of their jobs. Claire McCaskill claimed there was no reason for Sessions to meet with the Russian Ambassador, even though it’s part of his job on the Armed Services Committee. She then claimed she hadn’t met with them, but her tweets show otherwise. More lies. In fact, the left has met with the Russians far more and there are pictures all over the place showing it. 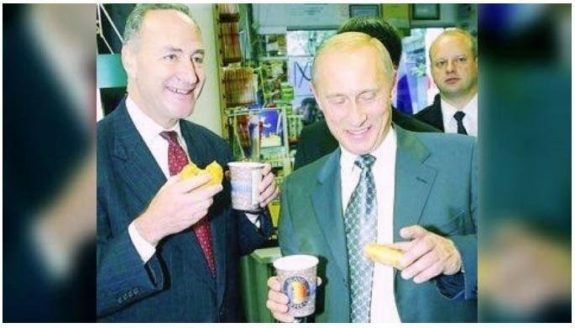 Below, you will see two photos of Chuckie Schumer, who met with Putin and had donuts. I kid you not. Did anyone ask Schumer if he had been flipped? No, that would be ridiculous, although a lot more believable than Jeff Sessions. Just sayin’. All of the sudden, leftists see Russians everywhere, but where were they when Obama was telling them he could be ‘more flexible’? Where were they when Hillary Clinton was setting up Skolkovo, Russia’s version of Silicon Valley? Or when Clinton gifted our uranium to the Russkies? But let Jeff Sessions meet with the Russian Ambassador during the course of Senate work and the cries of treason are everywhere. It’s just pathetic. The hysteria over “speaking to Russia” has truly reached fever pitch. It’s gotten so ridiculous that even a random conversation with an ambassador — something over thirty Democrat Senators have done, because it’s PART OF THEIR JOB — becomes tantamount to treason. Never mind that in the case of allegations Russia somehow influenced the American election, there is ZERO EVIDENCE. Heck, even B. Hussein Obama said so! All of this is cover for Clinton getting trounced by Trump and the fact that the Democrats just refuse to admit it was because she sucked as a candidate and as a human being. Now, they are like a bunch of peasants with torches and pitchforks… they want to bring Trump down and burn him and his cabinet at the stake. This is going to blow up on them spectacularly. The hypocrisy is so thick you have to shovel it in Congress these days. If they are going to question Sessions like this, a man they fear like holy water to a bunch of frigging vampires, then I think every one of them should have to undergo background checks and intense interviews themselves in front of Congress. And I think that there should be consequences for their actions. It’s really rich when you have a bunch of communists screaming about Russia when they are basically soul mates. Obama is mixed up in all of this too. Those who point the finger at someone like Jeff Sessions over Russia are almost assuredly guilty of the same thing… guilt by association. Jeff Sessions has in the past stood strongly against Russia and you would be hard pressed to find someone of more ethical character than Sessions. The left should not accuse others of things they do themselves. Take a pill, sit down and shut the heck up. You are making fools of yourselves. 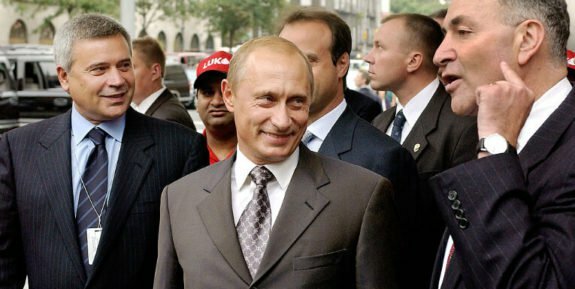 Schumer welcomed Putin to New York City as Russian oil company Lukoil opened a gas station in Manhattan.